You’ve either been dreaming about it or already organizing a holiday in the Italian capital, but with so many historical sites, pieces of art, beautiful piazzas, you can’t stop wondering what to do in Rome during your three-day stay. Your concerns are very much justified since a lifetime is hardly enough to see everything the eternal city has to offer, especially because researchers and archaeologists make new discoveries on a daily basis. So no worries, most travelers have gone through the same dilemma. This is why I came up with an easy itinerary on the absolute must-see places for whoever comes to Rome for only three days. Obviously, three days are not even enough to see the most popular tourist attractions, not even if you spend the whole time running, but while I suggest you stay longer, I’ve done my best to shrink as much as possible in as little time as possible. Many are the places lesser known or not mentioned at all in the guidebooks, and I’ll make sure to devote next posts to those sights too, but for now, enjoy these essential tips on what to do in Rome if you are staying only three days. All laid out around the Palatine Hill, this certainly is a place not to be missed for anyone heading to Rome for the first time. Why? Apart from being famous, the Colosseum, the Roman Forum and the Palatine Hill are the areas where, according to the myth, Rome was created. Myth apart, the reality is that this area is always listed among the places to visit in Rome. 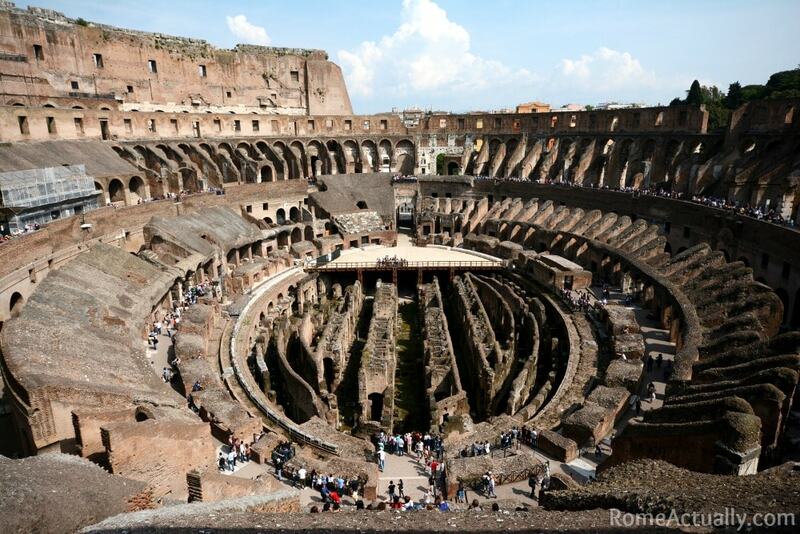 The Colosseum is rich in history and evokes movies, TV shows, and countless stories. Symbol of the Romans’ slightly barbaric taste for entertainment, after the fall of the empire the Flavian Amphitheatre was abandoned and later probably used as a storehouse. With the same ticket to access the Colosseum (12 euro lasting two days), you can also visit the Roman Forum and the Palatine Hill. In origin, the valley where the Forum lies was a marshland, and only after it was cleared in the 7th century BC it became the pulse of imperial Rome’s public life for more than a thousand years. Throughout the centuries many buildings for political religious and commercial activities were erected, and in the 2nd century BC also the “basilicas” for judiciary activities. By the end of the Republic times, the Forum had become too small and inadequate for being the administrative and representative center of the city. The imperial dynasties that followed only added self-consecrating monuments. If you go early morning to the Colosseum (highly recommended for the big queue), you will manage to do also the Roman Forum on the same day before lunch. To skip the line at the Colosseum and explore ancient Rome, you can book a premium Colosseum tour with Roman Forum and Palatine Hill. If, on the other hand, you want to enjoy an unusual visit to the Colosseum, try the VIP night tour after closing time. They will also open areas normally closed to the public such as the arena floor. From the Colosseum take a stroll along the Via dei Fori Imperiali and reach Piazza Venezia, from where you will take Via del Corso for a bit of stylish shopping and from where you can get to the Trevi Fountain taking an alley on your right-hand side. The Trevi Fountain needs a very little introduction as it’s one of the most popular and visited places in Rome. The rococo-style fountain was first started in 1732 by architect Nicola Salvi and finished in 1762 by Giuseppe Pannini. The monument, named after the Virgin Water, gets the water from one of the biggest Roman aqueducts and symbolizes an Ocean on a shell-shaped chariot pulled by seahorses led by Tritons, sea gods. Before leaving, don’t forget to throw a coin to make sure you will come back to Rome. After the Trevi Fountain, head to Piazza di Spagna to climb the Spanish Steps and, why not, do some expensive window shopping along the brand-packed Via dei Condotti. Tips for lunch: This area is a bit tricky for restaurants as it’s very touristy so the quality of the food not always great. Here I would suggest places such as Matricianella in Via Leone 4 for traditional Roman dishes, Cavalier Gino in Vicolo Rosini 4, cozy atmosphere and usually packed for lunch so try to book (Phone 06 687 3434), or fancy Baccano in Via delle Muratte 23. The Vatican City is an endless display of artwork, starting from Saint Peter’s Square, carrying on to the Basilica all the way through the Vatican Museums. With so much to see, the Vatican will easily take you the whole day. I would start from the Vatican Museums early in the morning to find fewer people in the line and also inside. Seven centuries of art commissioned by the Popes to the best artists of their times, and gifts coming from kings, queens, presidents and leaders from all over the world are concentrated all in one place. It’s impossible to see everything in one day, let alone in one morning, but we do what we can, right? Within the Vatican Museums there are many halls and museums to be seen, but if you think you are running out of time, please make sure you don’t miss the Sistine Chapel where is world-renowned The Last Judgment fresco by Michelangelo Buonarroti. After lunch, I would suggest you round off your Vatican day by visiting Saint Peter’s Basilica, the center of Christianity and one of the world’s biggest basilicas filled with marble artwork. 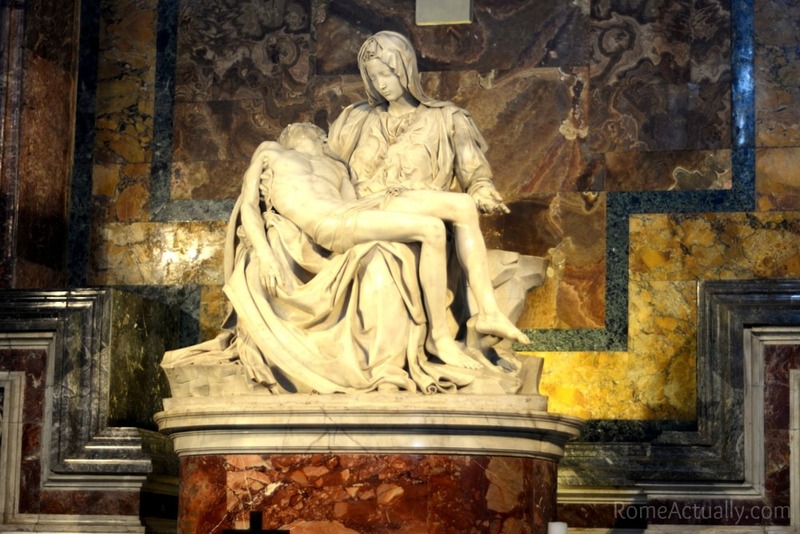 Here on display the Renaissance sculpture La Pietà also by artist Michelangelo. After visiting the many small chapels inside the basilica and peeked under the main imposing altar from the glass window, it’s worth it going also underground where there are the tombs of the previous popes. Entrance is free and, like for the whole basilica, a decent dress code is required, meaning no shorts, miniskirts or short dresses, and sleeveless t-shirts. There is also the possibility to visit the necropolis where the tomb of Saint Peter is kept right below the basilica but booking directly with the Vatican authorities is necessary. The brave (and fit) can also climb to the Cupola (Dome), open every day from 8 am to 6 pm (7 pm in summer). Price is 8 euro if you take the elevator and then climb the remaining 320 steps, or 6 euro if you climb the whole 551 steps. Tips for lunch: Here too eating is a bit tricky as it’s one of the most touristy areas of the city. Yet, my options when I go there are Camillo B. in Piazza Cavour, open from breakfast to dinner and with an unlimited buffet on weekdays, Porto, in Via Crescenzio, fish food in original combinations and also with a buffet on weekdays (9 euro including water), and Taverna Vegetariana (I think now it’s called Veg & Wine), in Via Trionfale 94, delicious vegetarian/vegan restaurant. If you happen around Via Cola di Rienzo, do stop at the gelato shop La Romana, at the number 2. They have delicious flavors and the possibility to put some melted chocolate, black or white, inside your cone before the ice cream scoops. To know more about the Vatican, what to visit and how to book, check out our full guide to the Holy See. If on the third day you are still wondering what to do in Rome, make it all about enjoying the city’s beautiful piazzas, architecture and street life. 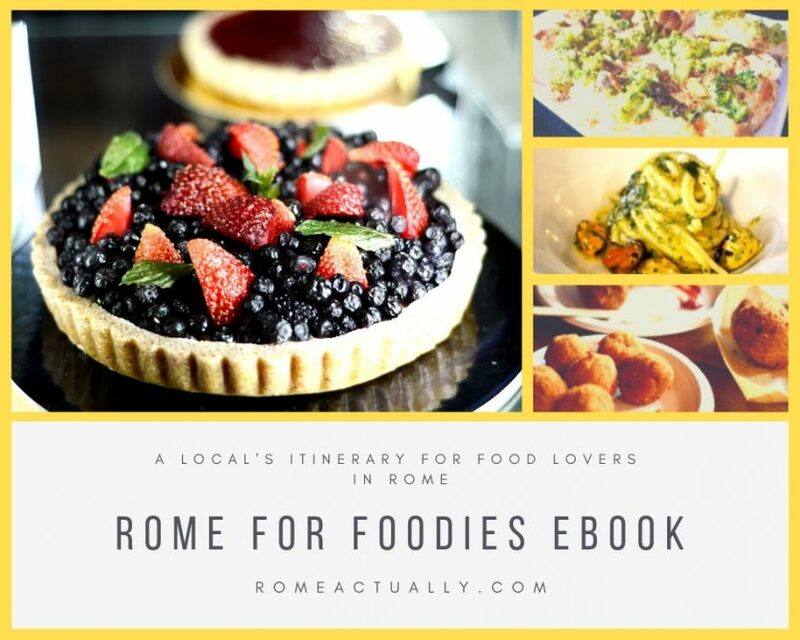 I will start my suggested itinerary from the Pantheon and end it in Trastevere, but you can do it the other way around, depending on your preferences and also where you will stop for lunch (below my restaurants’ tips!). The Pantheon is a church built on top of a Roman temple devoted to all gods (pan=all, theon=god). At present one of the oldest temples in Rome, the dome of the Pantheon has a hole, oculus, originally meant to directly connect the faithful with the gods. Built in the 2nd century AD by emperor Augustus, now it’s a catholic church where the tombs of some of the members of the former Italian royal family and the grave of Renaissance artist Raffaello Sanzio are kept. The walk between the Pantheon and Piazza Navona is very short, even though on the way you can stop at the church of Saint Louis of the French (San Luigi dei Francesi) and admire three masterpieces from Caravaggio. Once in Piazza Navona, enjoy the square itself, with Bernini’s main fountain of the Four Rivers and the church of Sant’Agnese facing the fountain. If you are a history buff, head to the northern end of the square (Via di Tor Sanguigna 3) and visit the ruins of Domitian Stadium, an ancient racetrack that lies all beneath Piazza Navona built by emperor Domitian. After lunch, head to Campo de’ Fiori where the suggestive statue of Giordano Bruno, a Dominican friar, philosopher, and poet stands right where he was burnt at stake after being accused of heresy and tried by Roman Inquisition in 1600. A stone’s throw away is also Renaissance Farnese Palace which is now the French embassy so possible to visit only by booking a tour with their certified tour guide. Take any of the alleys that lead you to the Tiber and cross Ponte Sisto bridge to get to Trastevere. In a list of tips on what to do in Rome, you can’t possibly miss this area, popular among tourists and American students since there is the John Cabot university. A former working-class district, now Trastevere is very trendy, with many pubs, restaurants, and a lively nightlife. Here don’t miss places such as Santa Maria in Trastevere Basilica in its namesake piazza, the frescoes by Raffaello Sanzio in Villa Farnesina (Via della Lungara 230), and the Museo di Roma in Trastevere, a museum about Roman folklore and daily life in the 18th and 19th centuries. When in Trastevere try not to miss a fascinating basilica, Santa Cecilia in Trastevere (Piazza di Santa Cecilia 22). According to the myth, the church has been built on top of the house of martyred Cecilia, as she had wished before dying in the 3rd century. She was first buried in the Catacombs of St. Callixtus and moved to the church in the 9th century. Apparently, during renovation works in 1599 they opened the coffin where Cecilia was resting and found her almost intact, dressed in white and showing the wounds on her neck. Pope Clement VIII commissioned sculptor Stefano Maderno to reproduce the image of the body exactly how it was found, and the marble statue is today kept in the basilica. Tips for lunch: Here, even though pretty tourist destination, you will have a wider choice of good restaurants. Just beside the Pantheon, there is one of the best restaurants in Rome to try the traditional dish tonnarelli cacio e pepe (spaghetti with cacio cheese and pepper): Trattoria Armando al Pantheon in Salita dei Crescenzi 31. Always packed for lunch, reserve a table or you will never make it. Going towards Campo de’ Fiori, in Via dei Banchi Vecchi 143, try Supplizio (closed on Sunday), the go-to place for anything street food. Nearby, in Via dei Chiavari 34, you will also find Forno Roscioli bakery for delicious bread, pastries, and pizza by the slice. In Trastevere itself, try Enzo al 29 in Via dei Vascellari 29, and Taverna Trilussa (open for dinner only) in Via del Politeama 23/35 for traditional Roman cuisine. I’m pretty sure that even though what to do in Rome mainly involves historical sites, at some point during the day you will feel the need of a gelato. Don’t worry, you’re covered. In Trastevere you can have a delicious ice cream at Fiordiluna, Via della Lungaretta 96, and GROM in Via dei Giubbonari near Campo de’ Fiori or in the same Piazza Navona. Do you prefer being guided by a local to get under the skin of the city and know is secrets? You can book a “Rome like a local” tour to unearth the city’s hidden gems that only locals know and unexpected sides of Rome. If you have limited time and want to optimize it as much as you can, book a “Rome in a day” tour where a guide will take you to all the main landmarks, move around with a private transfer and skip all the lines (Vatican and Colosseum). The tour lasts some 8 hours, but in the end, you will have seen the top sights and enjoyed a pretty hassle-free day. You arrive in Rome late afternoon but you don’t want to waste a single minute. Enjoy your evening with a twilight city stroll around Rome city center and a delicious gelato tasting before fully immersing in your Italian holiday.